Sebastian Mihai - Vectrex - Who needs pixels, anyway? While the vast majority of videogame consoles hooked into television sets and displayed raster graphics, whereby a scene, or characters are represented by grids of rectangular pixels. However, there was one system which tried something different. 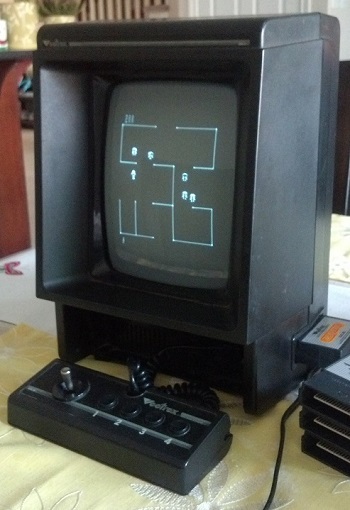 The Vectrex was meant to provide an arcade experience at home. And while this was the goal of many other systems as well, the Vectrex actually had a built in screen and resembled an arcade cabinet. In terms of graphics, the Vectrex used a vector display. This meant that the concept of pixel did not apply; some say it had "infinite resolution", but the truth is there are still hardware limitations to how thin a drawn line can be. Speaking of lines, that's about all the Vectrex can display: white lines and dots. If you crank up the brightness, the graphics are really bright and beautiful. The feeling I got from playing it is that the graphics feel very smooth, as if the frame rate was extremely high. This would be unusual for the video game systems of the 90s, let alone for one created in 1982. This, in my opinion, made the Vectrex more fun to play than newer systems such as the Atari 7800.